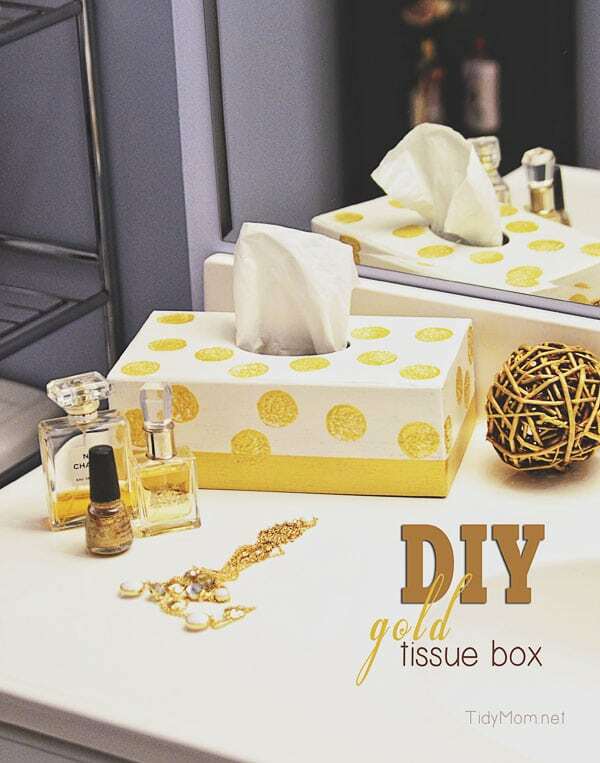 DIY Gold Tissue Box: A simple DIY project – an old tissue box gets a face lift and turns into a trendy gold bathroom accent. 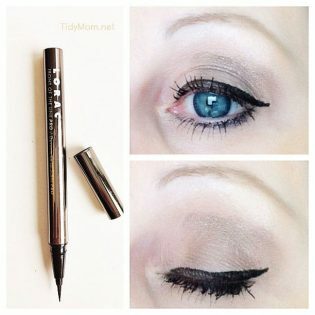 Since we moved, my head is swimming with DIY ideas, but some times it’s overwhelming how much I want to do. You see, I’m an impatient person……I want things to happen fast. Large project intimidates me, so I thought I’d start small. 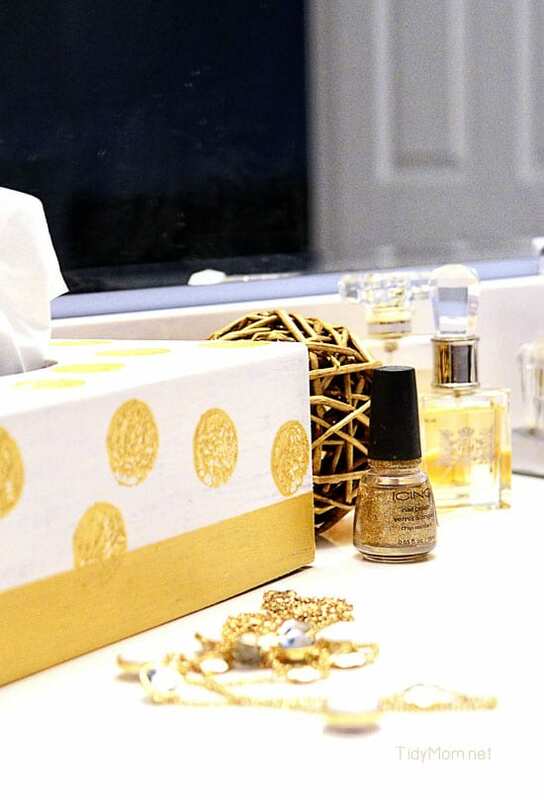 I love the new trend of gold accessories, so I thought I’d give a few old accessories a quick face lift. 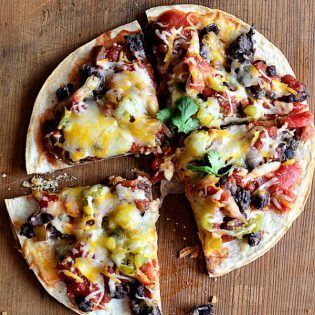 I had everything I needed right at home, and clean up was a snap. Do you have some of these grapevine balls laying around? If not, you can find them in most craft stores. 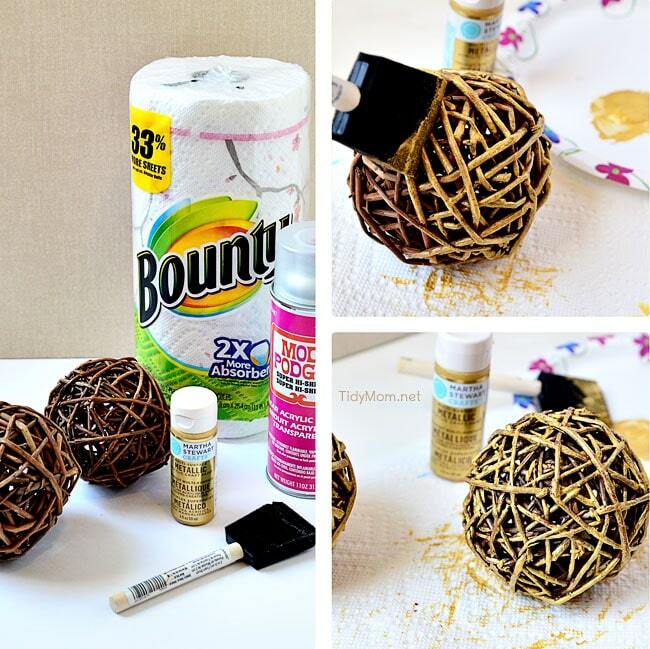 I laid out a few Bounty paper towels to paint on, grab some gold paint and a sponge brush and got to work. I love how they look fresh and trendy again. I may have to pick up a few more to paint and put in a bowl. 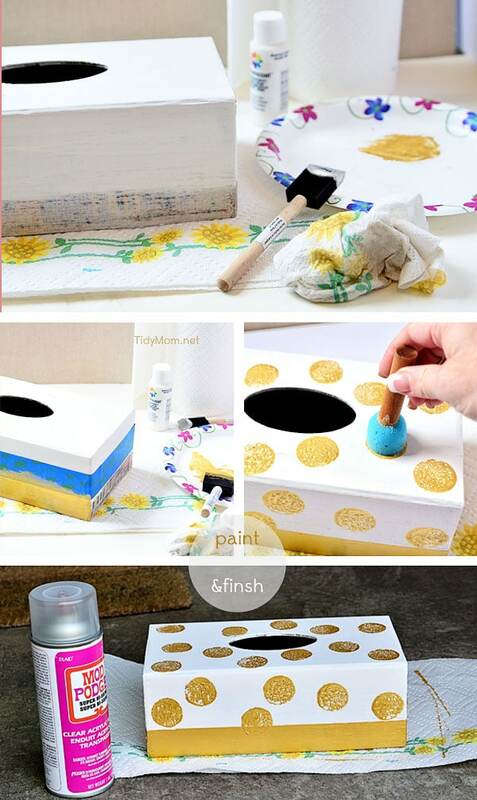 Next, I grabbed an old tissue box, along with the gold paint, white paint, sponge brushes, painters tape, sand paper, clear acrylic sealer and Bounty Paper towels. 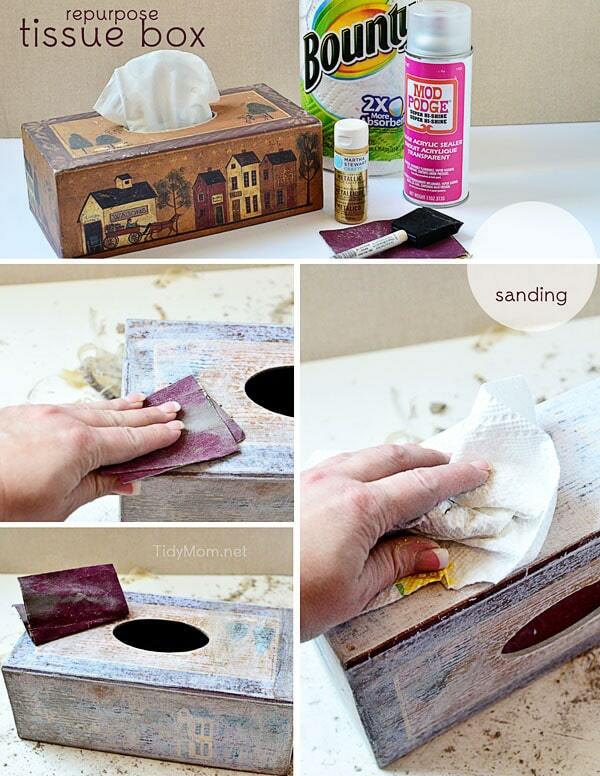 One I sanded down the old tissue box real good, then used a dry paper towel to dust off all the sanding. Two I used a damp Bounty Paper Towel to wipe down the entire tissue box to make sure it was dust free. I waited about 10 minutes to start painting, to make sure the box was dry. Three I painted the tissue box with a few coats of white acrylic paint, letting it dry between coats. I only painted 3/4 the way down on the sides. Four After the last coat of white was dry, I used painters tape and marked where I wanted to paint the gold on the bottom third of the tissue box. – and gave it a few good coats of gold paint. Five I removed the tape while the gold was still wet, then used my round sponge brush to make gold circles on the top and sides. Six I took it out side to give it a nice coat of acrylic sealer. 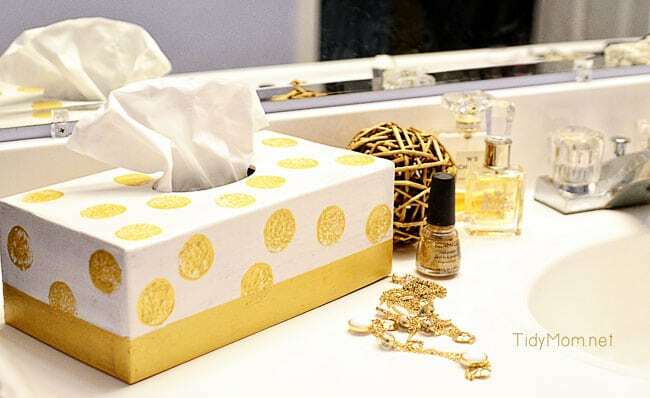 The gold tissue box and grapevine ball look perfect in Allison’s bathroom right now. The people at Proctor and Gamble and Home Depot and I have teamed up to help you get your DIY on and help clean up the mess by giving one lucky TidyMom reader some Bounty paper towels and $250 to Home Depot! Pretty Sweet huh?! Disclosure: This post is sponsored by The Home Depot and Proctor & Gamble, however all opinions and my love for Bounty Paper Towels are 100% my own. Next project….landscaping!!!! New garden area and relax area, yep time to soak up the sun! !